This is the second MAC lipstick i got from the Heavenly Creatures collection. Its the shade Pleasureseeker that is actually a re-promote from the Neo Sci-Fi collection which was way before my MAC loving time. 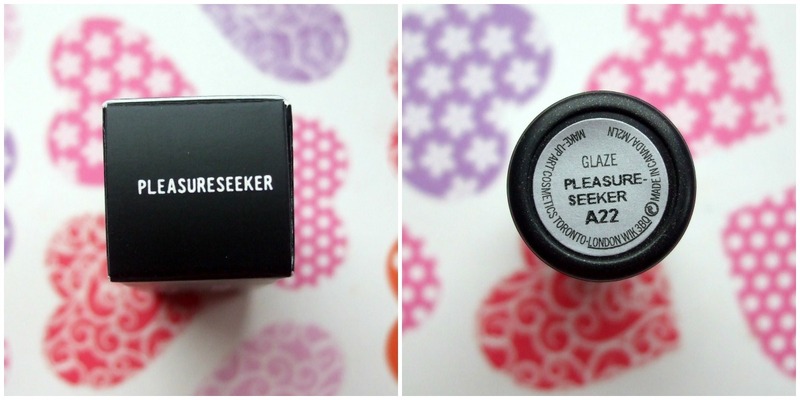 From the description alone i was pretty much sold, as it is described by MAC as a creamy peach. It has a glaze formula so it is pretty sheer and lacks major pigmentation so if you are expecting a opaque colour this lipstick may not be the one for you! It takes quite a lot of applying to build up colour however once applied it is a nice, light peach shade that is suitable for everyday. It feels a little like a lipbalm with the glaze finish however it does have a slight hint of shimmer so can like a little frosty on the lips. Overall, Im happy. I love peach lipsticks that have a slight orange/coral undertone and this is quite sheer so is perfect for everyday wear. It is still available to buy from the MAC cosmetics website here for £14. Absolutely beautiful colour! I love the fact that is is quite opaque and wearable as most of my lipsticks are so bright! looks nice, the frost wouldn't suit me though! Oh my GOD, this is perfection. I want it. What a lovely wearable colour! Its really subtle yet pretty! That's a lovely subtle summery shade. You suit it.